Most of the time, I love nothing more than spending hours in my kitchen. I’ll queue up some podcasts on my Bluetooth speaker (currently listening to Gravy, a look at the evolution of American Southern culture through food), and get to work prepping vegetables, experimenting with recipes, even just reorganizing my cabinets or cleaning my fridge!! It’s definitely my ‘cozy place’ in the house. But when I’m tired or don’t feel like cooking, I SUPER don’t feel like cooking. 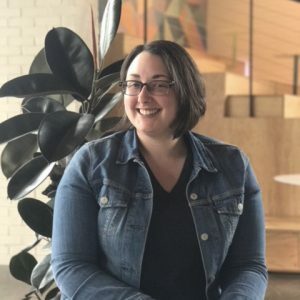 On those nights, it’s great to have a couple standby recipes that are easy to whip up, to save me from spending all of my money on takeout. Seriously. I’m a serial food-delivery-app abuser. 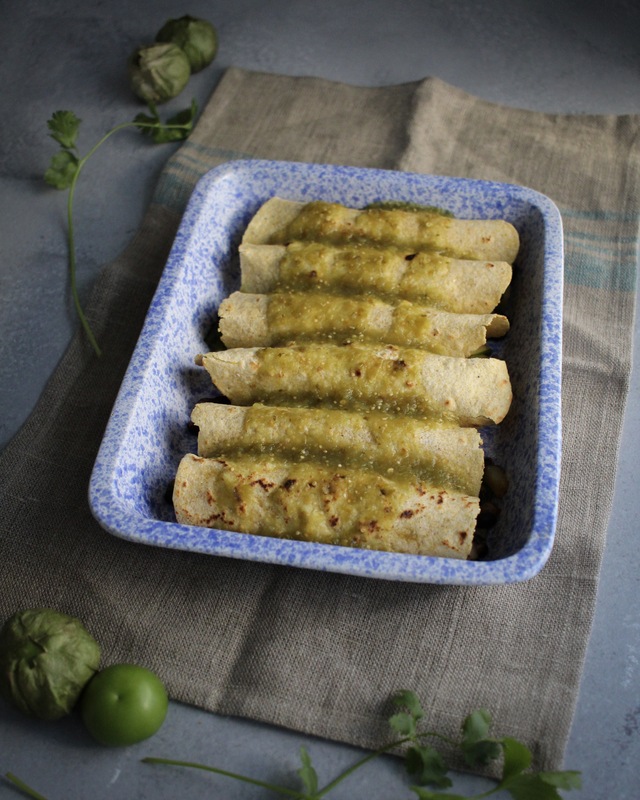 These enchiladas verdes are great because they are so FAST. Just dice some veggies, cook the filling, fill the tortillas, bake for a few minutes, and you’ve got yourself a delicious dinner that’s as good as takeout. 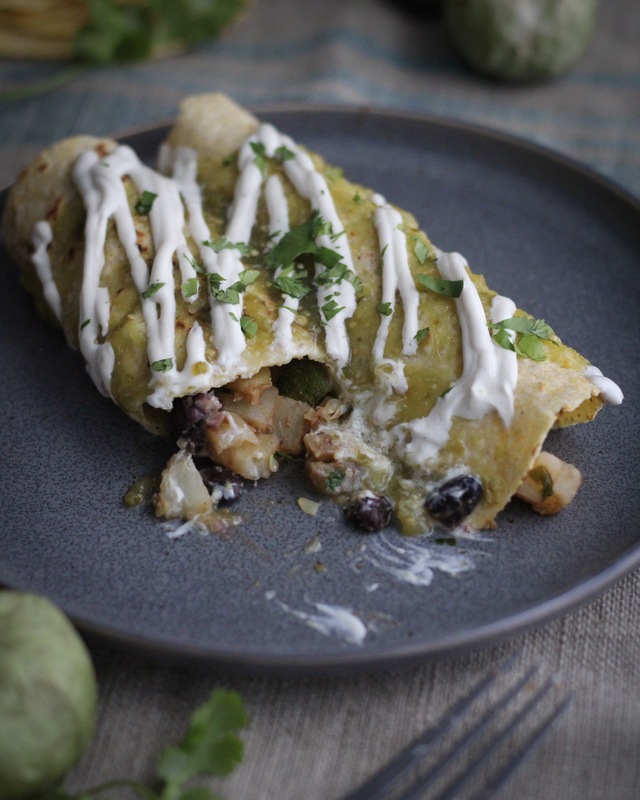 The filling is perfectly spiced and savory, hearty with black beans and potatoes; a perfect counter to the light corn tortillas, tangy salsa verde, and cool, rich sour cream/cashew crema. 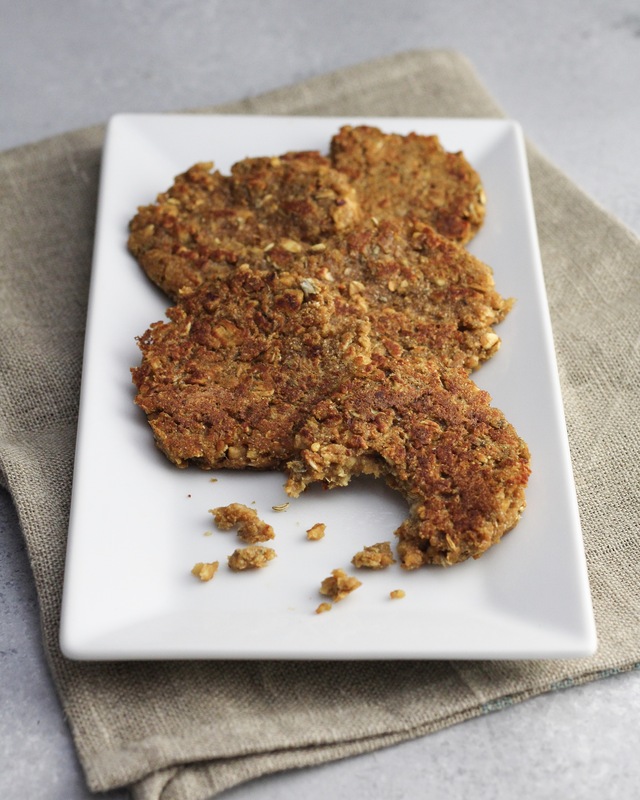 From start to finish, you can have these on the table in a half an hour. And if you have extra time, why not make homemade tortillas? If you’ve never made them before, you’ll be surprised at how simple they are to make. I like this recipe from King Arthur Flour, which combines cornmeal and all purpose baking flour, because I don’t usually have masa marina on hand (the more traditional finely ground corn flour for corn tortillas), but I always have some cornmeal (much more thickly ground) hanging around for cornbread, polenta, or baking pizza. Same with the salsa verde! 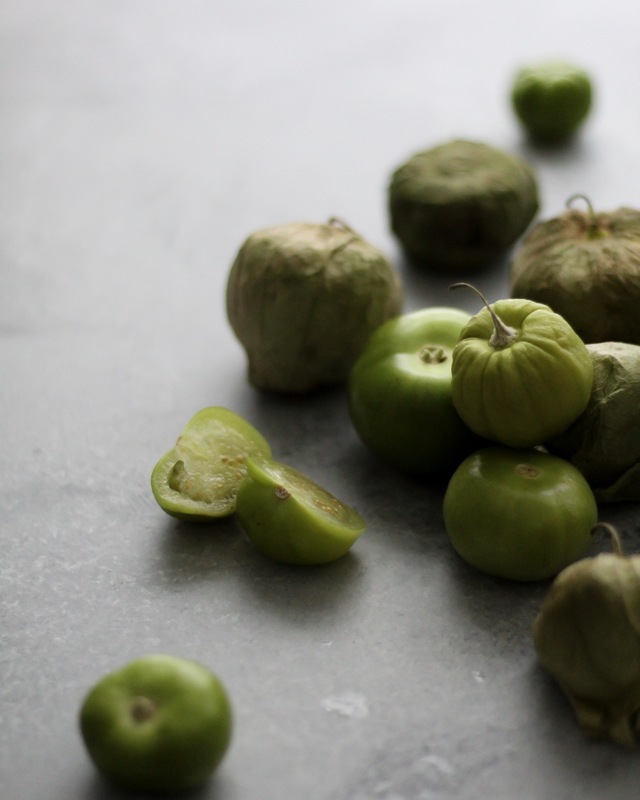 Dressing this recipe up or down, make your own salsa verde (check out my recipe HERE), or use a store-bought brand! I really like the Herdez brand, which is perfectly tangy and flavorful. 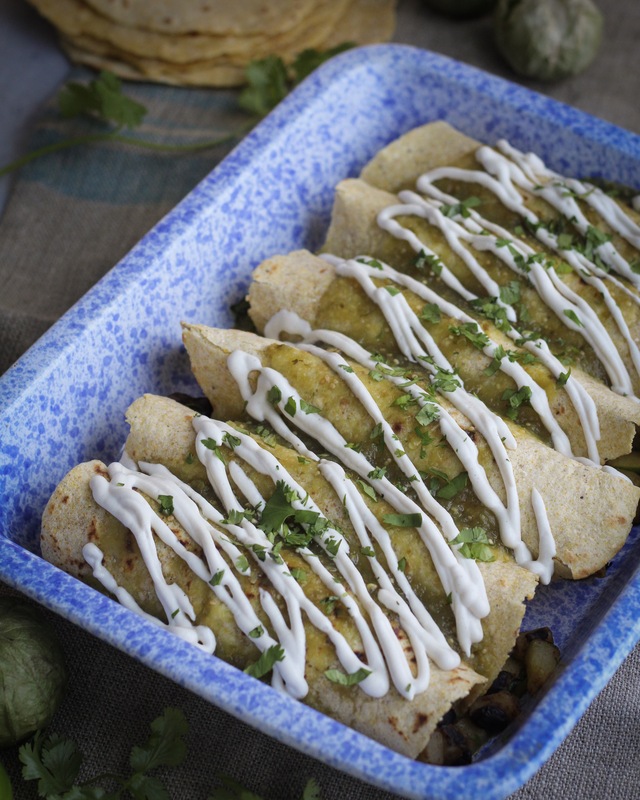 savory veggie enchiladas are topped with tangy, slightly tart salsa verde. a quick and easy to assemble meal! the cooler flavors of the green sauce are great for hot summer night dinners. Heat 2 tbs oil in a large skillet over medium heat. When hot, add diced potatoes, salt, cumin, onion powder, and paprika. Stir to coat potatoes thoroughly in seasoning. Cook for 10 minutes, stirring frequently to keep potatoes from sticking. At this point, potatoes should be slightly soft. Add diced zucchini, stir, and cover skillet. Cook for another 10 minutes, stirring periodically. Add rinsed black beans and chopped cilantro. Stir again, and cook for another 2 minutes. Taste and adjust seasoning as needed, then set aside filling to cool. Heat oven to 350°. Spoon 2-3 tbs of salsa verde on the bottom of a casserole dish. Fill each tortilla with about 2 heaping spoonfuls of filling, roll up, and place seam side down in the dish. Repeat until dish is full. Place dish in oven for 5-10 minutes, until heated completely. 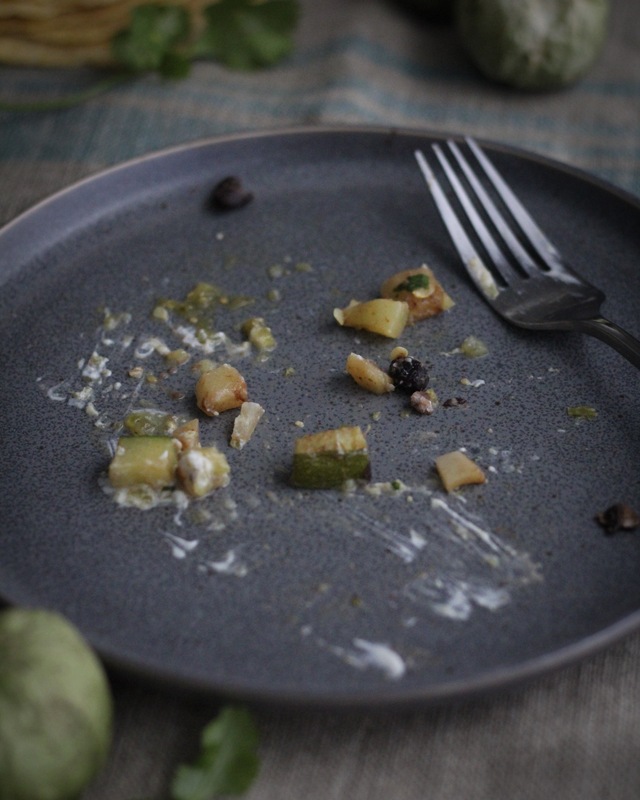 Remove, and garnish with sour cream or crema, and more chopped cilantro. 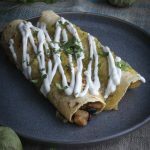 -Try out this recipe for Homemade Salsa Verde, ready in 10 minutes for your enchiladas!